Fry’s Spring Beach Club has been providing swim lessons to children of low-income City and County families since 2012. 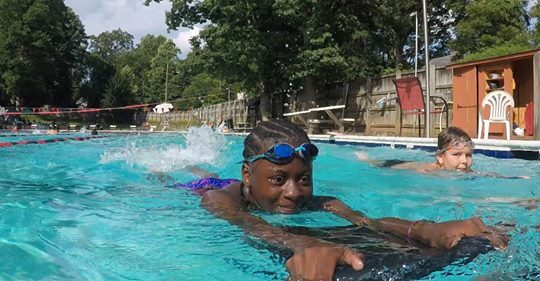 Spearheaded and run by member Beth Bullard, FSBC has partnered with the Ben Hair Just Swim for Life Foundation (BH-JSL) to offer free learn-to-swim lessons to over one hundred children per summer. More than half of the students hail from neighboring Southwood Mobile Home Park. According BH-JSL, the majority of the area’s low income and minority children cannot swim and feel uncomfortable around water. As such, the program’s first goal is to “waterproof” kids so that they’re safe around water. FSBC welcomes program participants and their families to enjoy the grounds and pools during lessons. Once participants graduate from the program and are able to swim, FSBC provides swim team scholarships to children interested in pursuing swimming at the club. The goal is for children to grow up and thrive at FSBC, from learning to be comfortable and safe in the water to competing and participating as part of the swim team. In order to ensure that these children are fully welcomed and supported in our community, we further offer full memberships to the swimmers and their families. In 2018, FSBC provided 15 membership scholarships. We would like to increase this number in 2019 and could use your support. Each $1,115 raised registers a child for swim team and provides 5 days a week of twice-daily swim instruction and team-building activities. It also provides the child’s family with full club membership, giving them access to FSBC pools and facilities during operating hours and an array of classes, programs, and events. FSBC waives all new member fees for these families. Program graduate Ashley is now a member and swim instructor at FSBC. Thank you for considering sponsoring a family for the FSBC Scholarship Program. If you are a business interested in become a sponsor, we offer several levels of sponsorship and advertising benefits. Individuals may also make monetary donations in any amount through the link below or by contacting the club director. Our goal is to raise at least $20,000 in scholarship funding this year. Check out our progress and see who has donated. Thank you for your support!